After five and a half years away from Boston, Nomar Garciaparra, returned to the Red Sox yesterday, if only for a few hours. The legendary shortstop, whose first name (pronounced, affectionately, No-mah) was once synonymous with Boston baseball, announced his retirement shortly after signing a minor league contract with the Red Sox. In a jovial press conference, Garciaparra and general manager Theo Epstein said it was fitting to send off the Sox icon in his old uniform. Epstein had nothing but praise for the shortstop he dealt away in a contentious mid-season trade in 2004. “He’s a huge part of this franchise. He’s a red sock. And For a long time, the Red Sox really were Nomar Garciaparra.” Epstein said. 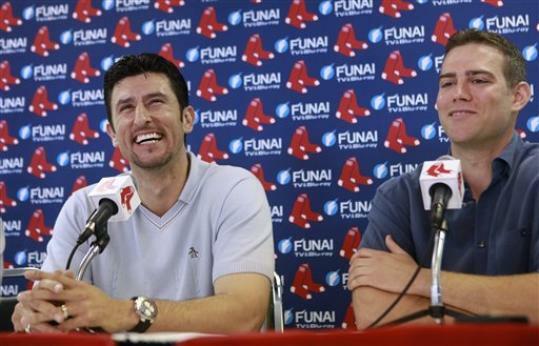 “Nomar’s never held a grudge. I’ve never looked at it as something that I’d wanted to do,” he added. Selected by the Sox in the first round of the 1994 draft, Garciaparra quickly broke into the big leagues; he won Rookie of the Year in 1997 while batting .306 with 30 home runs. He made six All Star teams and twice reigned as AL batting champion, in 1999 and 2000. But in 2004, an Achille’s tendon injury greatly diminished his fielding range. With the Sox in the thick of the playoff race, and with defense a serious concern, Epstein dealt Garciaparra in a multi-team deal that brought Gold Glover winners Orlando Cabrera and Doug Mientkiewicz to Boston. That move ultimately proved successful, as the Red Sox went on to (finally) win the World Series that year. Despite missing Boston’s title run, Garciaparra said he felt no resentment over the trade. Rather, he applauded the 2004 team for ending the 86 year championship drought, and the fans for never losing faith. The 36 year-old Garciaparra, who finished his career with a .313 batting average over 14 seasons, will not leave baseball entirely; he has already signed on to be an analyst for ESPN. « Is Jerry Remy’s Sports Bar Already Open?